I am so excited for my first feature exhibit since moving to Florida. “Greetings from Florida” opens tonight at The Dancing Crane Gallery in the Village of the Arts in Bradenton. 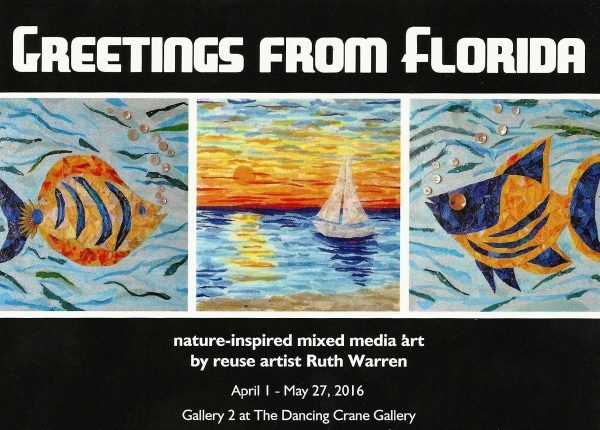 “Greeting from Florida” features nature-inspired reuse art with a colorful collection of art that includes tissue collage, fabric mosaic and button mosaic techniques. The exhibit will run April 1 – May 27 in Gallery 2 at The Dancing Crane. Artist receptions will be held Friday, April 1 from 6-9 pm and Friday, May 6 from 6-9 pm. Stop on by and lets’ talk abut about reuse art!